Bastedo Lake is a small and intimate lake with only a dozen cottages along the shoreline, offering great privacy in very tranquil surroundings. 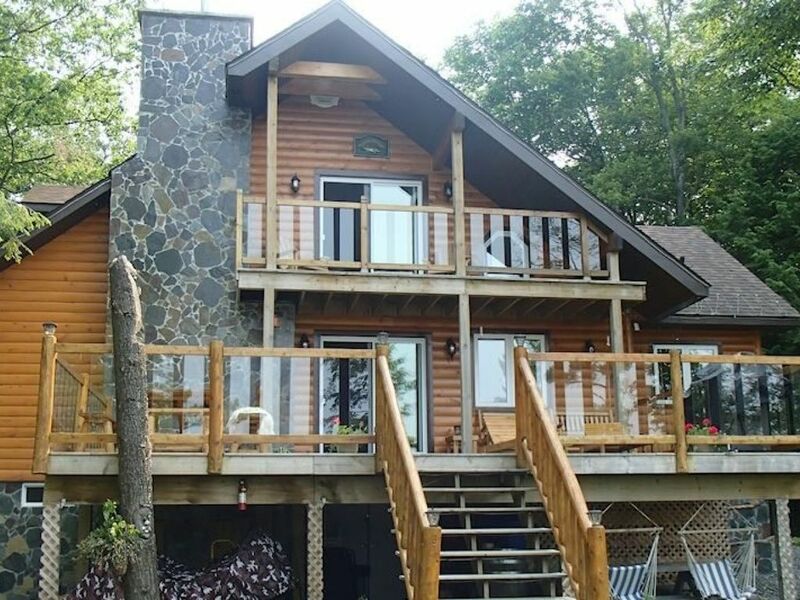 Only 10 minutes from Bala, this is a great opportunity to vacation in the heart of Muskoka and avoid the busy-ness of the larger water bodies while being close to the four season activity in the popular Muskoka village. The five-bedroom cottage is pretty spectacular too. We always look for a ‘wow’ factor in cottages we visit and this one didn’t disappoint in any way. Natural wood and logs feature throughout the cottage and the stone fireplace in the living room creates a stunning centerpiece to an amazing property and will keep it warm and toasty if you are there in the cooler months. There’s so many unique aspects of the cottage, it’s a little difficult to know where to start. But we'll start with the hand-made pool table that converts to a dining table for twelve and shows off the owner’s craftsmanship There are shelves tucked into the staircase that are home to games, DVDs and books, and comfortable couches for lounging after dinner, or snuggling in front of the fire on a cooler evening. Whoever is nominated to cook will enjoy the fully equipped kitchen. and can chat with friends and family over the breakfast bar before presenting a meal on the beautiful dining table. The more adventurous will want to have a go at the outdoor pizza oven! There are two bedrooms and a full bathroom on the main floor. One bedroom has doors to a private deck area with chairs and a small table for relaxing outside and watching the deer that visit the nearby feeding station. Upstairs, three more comfortable bedrooms and another bathroom complete the accommodation. Sitting on several acres of woodland the log and stone-clad cottage blends into the natural surroundings offering spectacular views of the water from the spacious deck. Walkways lead down to the shoreline where there’s shallow water entry and a dock. Play volley ball, sit by the firepit or just relax on the deck and soak up the sun. Please note that there is an agreement among all cottage owners on lake to avoid using motorized craft on the lake. This is a great choice of cottage for those who love privacy and lots of space in an elegant surrounding.